If you shop online for jeans, you will notice that a size 12 in one brand can match a size 10 in another and a size 14 in yet another brand. This is really confusing and might make you give up the idea of shopping online for jeans. That’s why you should disregard the size and start shopping by measurements. 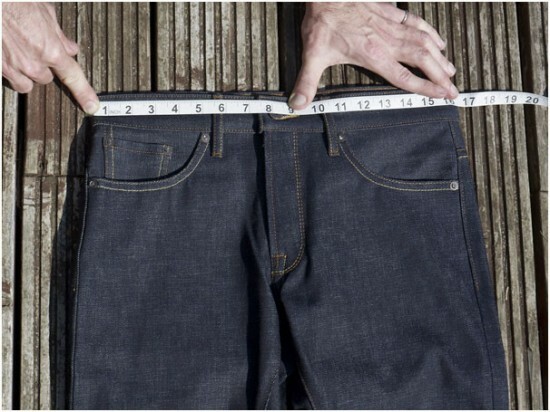 Find a pair of jeans in your wardrobe, which fit well, and measure the waistband. To do this, place the pants on a flat surface and measure from side to side, slightly pulling the waistband while holding the measuring tape. Take the number you get and double it. 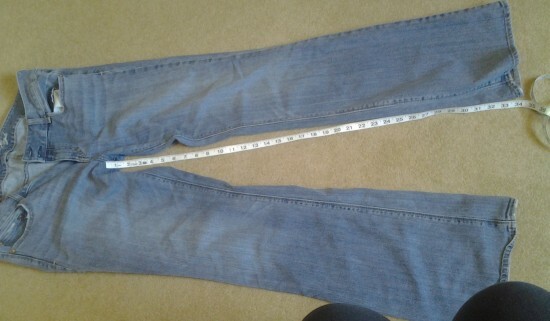 This is easier than trying to measure all the way around the waistband of the jeans. The next thing to do is measure the front rise of the same pair of jeans. 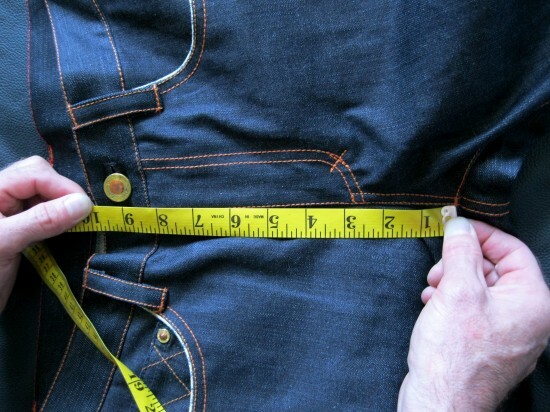 Place the measuring tape under the crotch area and measure to the top of the waistband. This is your front side number. Do not mix this number with the measurements from another pair of jeans. The waistband measurements and these measurements go together and can’t be mixed and matched. Another important measurement to take is the back rise of the jeans. Again, use the same pair of jeans and measure on a flat surface. The back rise of the jeans should be higher than the front rise. Most sellers do not list the back rise with the rest of the measurements, but it’s no fun to buy a pair of jeans, which fit perfectly, until you sit down. You can always email the seller and ask for these measures, before you buy the jeans. You will also need to measure the hips of the jeans. Take that same pair of jeans, find the bottom of the zipper and from there, go left and right. Usually, for size 10 jeans, it will be 20 inches. Double this and you have your hip number. For this example, it is 40. 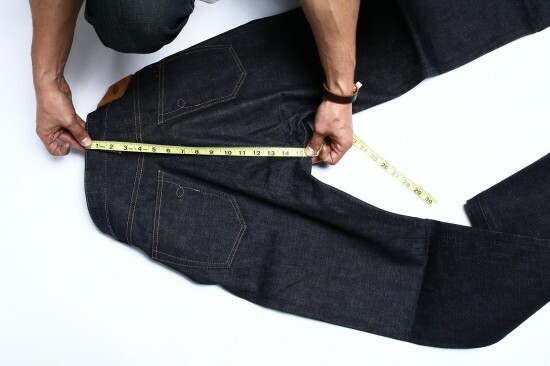 Before you start shopping online for jeans, you will also need to know the inseam measure. 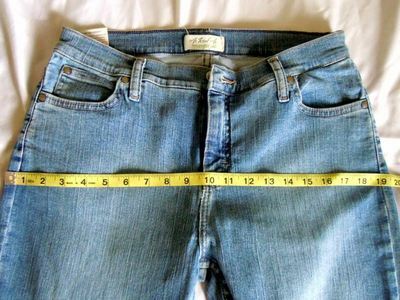 To find it, measure from the area, where the front and the back of the jeans meet in the middle under the crotch area, all the way down one leg to the edge of the hem. The last measurement you need to take is at the bottom of the hem. Lay the jeans flat on a hard surface and measure the bottom of one leg opening from side to side. You can compare it to the measure around the knee to find out of the jeans are straight, flare, or boot cut.